…and voilà, you have technomad-extraordinaires Chris Dunphy and Cherie Ve Ard from Technomadia! These two have been roaming the USA and running their technology consulting company together since 2006 and have created their own unique flavor of Technomadic success. Each year since the beginning of their journey they have criss-crossed the United States, averaging about 20 states a year. Their nomadic lifestyle gives them the opportunity to work and live in any location they want in the United States as well as the freedom to travel abroad. It’s a dream come true for any travel enthusiast. In the spring of 2006, Chris was laid off from his job at a large mobile technology company in San Francisco. Though he was still passionate about this field of work, he wasn’t interested in going back to a traditional job. His love for travel and his intrigue with location-independent living inspired him to pursue a nomadic life. He had ample savings, no debt, and a large number of contacts in the technology industry that he could rely on if he desperately needed work. Without too much planning, and with a sense of nervous excitement, Chris decided he was going to adopt a nomadic lifestyle. In February 2006, he gave his landlord 2 months notice, sold his Prius, bought a jeep and a 16’ T@B camper trailer, sold most of his possessions, and made the move from apartment to trailer. Meanwhile, Cherie was living in Florida running the same custom software development business that her father started in 1977. She was able to work from her home and often joked with her clients that she could be working from anywhere in the world as long as she had a computer and a fedex nearby. She was already traveling frequently for business, and she decided to begin extending these trips to do more sightseeing and exploring. It dawned on her that since she could work location independently, she could initiate her own extended travels and take her career along with her. Just around the time Chris was moving out of his apartment, Cherie and Chris interacted in an online Toyota Prius forum. They connected over their many shared interests in technology, travel, and Priuses, to name a few, and decided to meet in San Francisco on one of Cherie’s upcoming business trips. When she arrived, Chris was already living out of his T@B trailer. Upon meeting they felt an immediate sense of intimate connection. Their first date set the tone for their current relationship. They went on a romantic nomadic day trip with Chris’ mobile house that ended up lasting 27 hours. Neither Chris nor Cherie was looking for love at this time in their lives but they knew this connection was something too special to overlook. In early 2007, as their love blossomed, Cherie decided to take a risk and head out on the road with Chris full time (while still paying the mortgage on her house in Florida). They started their own software consulting business together and after 7 months of living on the road, they decided that this was the lifestyle and relationship that they had been looking for. In the summer of 2007, they committed to each other at Burning Man. Cherie and Chris recounted how they had really jumped head first into this nomadic life: a new romantic relationship, moving in together without having gone through a traditional dating process, and an unconventional lifestyle of nomadism. One of the biggest challenges C&C faced in the beginning was the lack of community. Cherie explained that when you take on a nomadic life, “You lose having a witness to your entire life;” your long-term friendships consist of email updates and occasional phone calls. They explained that it was difficult to maintain any sense of continuity of their friendships. And every time they showed up in a new place, their interactions would often include sharing the same old story of what they were doing on this nomadic journey. They missed the depth, ease, and closeness of previous friendships. Over time though, C&C built an extended community of friends all throughout the USA using a combination of their blog, couchsurfing.org, and other online sources to reach out to new people. These friendships have become an integral part of C&C’s nomadic life and often influence their travel planning. C&C have found that with publicizing their nomadic adventures on their blog and other media sources, they have become prone to receiving a fair share of expectations, unwanted advice, and occasional criticism. “Sometimes people have an unrealistic perspective of us…they see us as Technomadia, not as Cherie and Chris,” Cherie remarked. It’s something C&C have learned to get used to. C&C joke about how they often are “accused” of being minimalists by their fans. C&C don’t identify with this term because minimalism is just an outcome of their lifestyle, not the goal. They describe themselves as conscious consumers. Chris emphasized that it’s important to constantly ask yourself: “what is the life you want and what are the things you need to enjoy that life.” But C&C are quick to acknowledge that the possessions they accumulated over their pre-nomadic lives were definitely anchors that weighed them down. They are both glad to have cut off some of that weight. In the winter of 2010, C&C got an email from a friend who was looking for someone to sublet their apartment on the island of St. John in the Virgin Islands. It didn’t take long for C&C to consider the opportunity and decide to move temporarily out of their camper and into the apartment. C&C emphasize the importance of not over-planning, nor getting stuck feeling like you need to always do the same thing. They explain that they wish to constantly be open to new possibilities, even if it means taking a break from the RV nomad life. For C&C, a technomad is anyone who uses technology to be mobile when they want and not be tied to one place; it doesn’t matter if they own property or are settled somewhere for 6 months. C&C have found that surprisingly about 90% of people they meet say that they wish they could have a similar nomadic lifestyle. People have said, “Oh you’re living my dream!” or “You’re really lucky.” Luck obviously has nothing to do with it. Creating a nomadic life is a result of hard work and intentional living. C&C acknowledge that most people often don’t have a realistic understanding of a nomadic lifestyle and that it is not suited for everyone. For those who are interested in nomadism though, it essential to take responsibility for creating the life you want. C&C are passionate about inspiring other people to be open to this lifestyle and to overcome their doubts and fears. They wrote an e-book to share the many valuable lessons they have learned while on the road. Answers to the Common Excuses: To Not Travel Full-Time covers such topics as logistics of nomadism, cost of living, building community, reducing environmental impacts, safety, healthcare, and other topics. C&C have whole-heartedly pursued two of the things they love most: technology and travel. Their experiences are a testament to what can be accomplished when you put intention towards your passion. 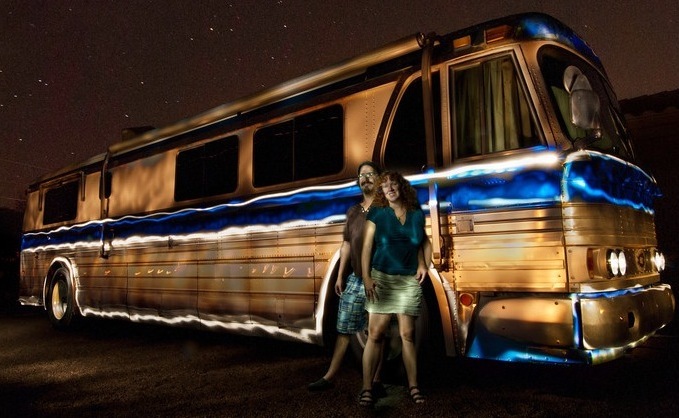 They’ve upgraded from the 16′ trailer of their first meeting to the pimpin’ vintage tour bus you see here. You can find a detailed photoblog on their website that shows how exactly it came to be, including pictures of the modern interior and C&Cs involvement in the construction of their own personalized home-on-wheels. If it’s your dream to build this type of lifestyle, start today. Create your vision and take small steps. Take the first step by sharing your dream in the comment section below. Very interesting. Well written article about a topic I know nothing about, or even knew existed. Hi Melanie, thanks for reading! I’m glad it introduced you to a new lifestyle.